Friedhoff Named to Top 10 Under 40 List | Stahancyk, Kent & Hook P.C. 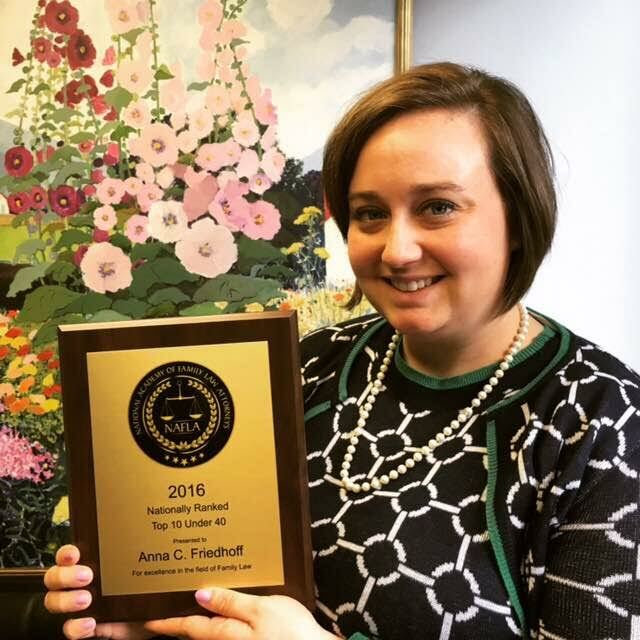 Stahancyk, Kent & Hook is pleased to announce that Associate Attorney Anna C. Friedhoff has been named by the National Academy of Family Law Attorneys to their Top 10 Under 40 list. Joining SK&H in 2012, Friedhoff has built a reputation as an experienced family practice and divorce attorney. She is an active member of the Oregon State Bar and Oregon Women Lawyers. She is also a member of the Oregon New Lawyers Division. Friedhoff received her J.D. from the University of Oregon School of Law in 2013. She is also a graduate of Gonzaga University and St. Mary’s Academy. In 2015, Anna eagerly joined the Italian Business Club as one of its first female members. She is a member of the Multnomah Athletic Club’s 20s/30s Committee, and stays involved with the mentorship program at St. Mary’s. The National Academy of Family Law Attorneys is an organization devoted to recognizing the top family law attorneys in the nation. Through a stringent selection process, the NAFLA awards the best family law attorneys in each state with its most prestigious honor of being named “TOP 10”. The very few attorneys (less than 1%) that are good enough to make our list have demonstrated an extraordinary amount of knowledge, skill, experience, expertise and success in their practice of family law.